5793 labyrinths found. Showing 3621-3640. Sorted by country, state, city, then zip/postal code. 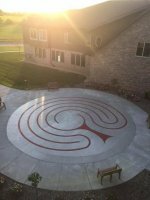 The labyrinth is located in the open courtyard of a senior housing complex. A sidewalk leads to the labyrinth from the road at the rear (west side) of the main building. 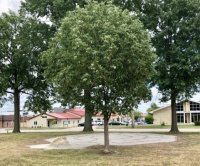 ID#613 Fresh Renewal Center, Inc.
We are located a few hundred yards south of the entrance to the Village of Loch Lloyd, MO. Labyrinth is grassy, in the shade of a grove of trees to the right of the entrance. Signage indicates parking and directions to labyrinth. When facing the front of the church, the labyrinth is to the left of the building; a sidewalk and path lead from the parking lot. 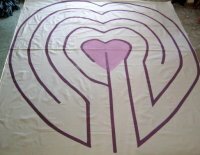 World Labyrinth Day Walk every 1st Saturday in May at 1:00 pm: Come and "Walk as One at 1", joining with others around the world who will be walking labyrinths at 1:00 in their time zones to "effect a rolling wave of peaceful energy as the world turns." Plan to come add your peaceful energy to this mission for the world. Southwest corner of the church complex, which sits on the intersection of Howard and Chestnut, 3 blocks south and 2 blocks east of the Carthage square. Mowed native wildflowers, on 1 acre. N 39 Deg. 9 mi° Lat. ; West 92 deg., 1° Long. The labyrinth is about three miles from the town of Chadwick in the Mark Twain national forest. Please contact me for detailed directions. The labyrinth can be walked at anytime, but please notify me before you go. 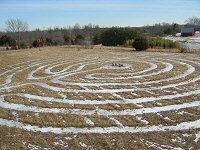 The labyrinth is a Chartres replica built on grass using rocks from nearby Swan Creek. 301 W. Green Meadows Rd. West side of Unity campus. Open all hours to all. The Fick Labyrinth is located on the East side of the building. Open dawn to dusk, but not open to the public when students are in session. School hours are 8:45am-4:15pm, Mon-Fri. School calendar is on the website. Chartres pattern made with bricks to define path amongst the native grass and flowers. The labyrinth in half in the sunlight and half in shade, in an area adjacent to a creek. 37 N° Lat. ; 91 W° Long.